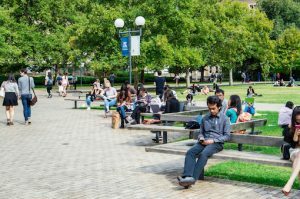 Academic freedom on Australian campuses is challenged by PRC international students who protest perceived slights to the PRC by lecturers or other students. PRC government officials are accused of meddling in Australian society by encouraging PRC students to oppose criticism of the PRC on campus. Universities risk losing vital revenue unless they take measures to address complaints by PRC students of isolation and being treated as ‘cash cows’. Domestic students and non-PRC international students are increasingly unhappy that PRC students with sub-par English skills are permitted to enrol. Any one of the above complaints pertains to only some of the 170,000 PRC students in Australian universities. However, even a minority could taint the image of the entire PRC student cohort and give rise to serious tensions. 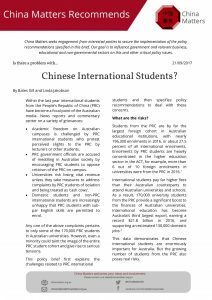 This policy brief first explains the challenges related to PRC international students and then specifies policy recommendations to deal with these concerns. This data demonstrates that Chinese international students are enormously important for Australia. But the growing number of students from the PRC also poses real risks. To begin, some universities have become highly dependent financially on the fees coming from PRC students. Some of the most popular university courses for PRC students—such as business and accounting—are often seen as ‘cash cows’, though few educators would publicly say so. As education costs rise and government financial support for education dwindles, the pressures to expand Chinese and other international student numbers are substantial. University leaders are well aware of such financial risk. They acknowledge that diversification of the international student body—for example increasing enrolments from India, Indonesia, and Vietnam— would be preferable, but it is difficult in practice given the enormous number of qualified and financially capable students from the PRC in comparison to those other nationalities. A decline in students from the PRC could arise for numerous reasons: the initiation of a major WeChat campaign to vent negative perceptions of the Australian education system; a belief that PRC students are not welcome in Australia or are at risk of harassment; an erosion of migration and employment opportunities for PRC students; or a downturn in Australia-China relations which restricts the flow of Chinese students. A second pressing near-term risk is the lowering of academic standards. This problem primarily arises because PRC students are often not proficient enough in English to keep up with coursework, participate in group projects, and contribute to in-class discussions. This is a particular problem in some of the most popular courses for PRC students—such as in business schools—where the proportion of PRC students tends to be extremely high. This means that classes could be ‘dumbed down’ to accommodate large numbers of PRC students or, more troublingly, that PRC students undeservedly receive passing marks for sub-standard work. These students have become too important financially to be allowed to fail. It is difficult to measure the extent of this problem—few administrators and faculty members openly acknowledge it. Universities compete fiercely for all international students. Certainly the perception of the problem exists among students, which in itself poses a risk. Local students (and other, non-PRC international students) complain that their education is hampered by the presence of PRC classmates. PRC students in turn may feel they are receiving a substandard educational experience. These perceptions give rise to tensions between PRC students and other students, which in turn tarnishes the attractiveness of Australian universities for PRC students. A third risk involves unsatisfactory experiences of PRC students in Australian universities. As a group, students from the PRC tend to integrate less in Australian society, and many if not most have little meaningful contact with Australians. Government surveys reveal that PRC students’ satisfaction with opportunities to interact with Australians is almost 10 percent lower than for other international students.5 Students from the PRC often find the relationship with their universities as overly ‘transactional’, are concerned with latent xenophobia, and would like to see more support to help them integrate with and learn from Australian society. An often-heard (and quite telling) complaint is that their oral English skills deteriorate while they are in Australia. More should be done to ensure their time here is as positive as possible and that they return home with a lifelong affinity for the country. They are ‘ambassadors’ who will not only shape the overseas choices of future students from the PRC, but who also represent a vast pool of goodwill and alumni support for decades to come. For most PRC students, the last substantive contact with their university is graduation day. Lastly, PRC government efforts to influence academic discourse have increased partly as a result of the larger presence of PRC students in Australian universities. Academic research, investigative journalism, and first-hand accounts all affirm that PRC students are actively discouraged by their government from speaking critically about the PRC and especially about the Communist Party of China (CPC). Moreover, students from the PRC are pressured—by officials at the PRC consulates and embassy and through organisations such as the Chinese Students and Scholars Association—to stifle classroom discussions on issues deemed ‘sensitive’ by PRC authorities, such as human rights, freedom of religion, internet freedom, sovereignty claims in the South China Sea, and Taiwan / Tibet / Xinjiang independence. They are encouraged to actively promote more ‘patriotic’ and ‘pro-PRC’ views on these and other China-related topics. Some are encouraged to engage in intelligence- gathering and report on the words and deeds of fellow PRC students as well as their teachers. These activities contravene Australian societal values and academic principles. They also undermine Australian interests to ensure institutions of learning are places for rigourous, uncensored, and respectful debate, where students and teachers are comfortable advocating their views and are open to contending positions. The vast majority of PRC students are politically passive, are not ‘stooges’ of the CPC, and have sufficient language skills to meet the normal requirements of a university degree. Generalisations and finger-pointing merely inflame relations on campus. On the other hand, not all zealous pro-PRC action on Australian campuses is directed by the PRC government. Some of the actions are initiated by individual students who ardently believe they should counter what they see as ill-informed views about the PRC. Others are more pragmatic —keen to demonstrate patriotism to boost career prospects upon their return home. Second, the fierce competition between Australian universities for the tuition fees of international students hampers cooperation. This short-sightedness must end. A decline in numbers of students from the PRC would be detrimental for all Australian universities. help deter over-zealous PRC citizens who try to limit class discussions critical of the PRC or on issues sensitive to the PRC government. help resist demands by PRC consulate officials to change lecture content. It is essential that universities nationwide—with the Go8 in the lead—adopt a uniform set of procedures to counter harassment and even bullying of lecturers (or students) who are deemed ‘anti-PRC’. The Go8 should explore ways to enforce a more binding code of conduct than the one currently in use, which expects students to ‘act consistently’ with values such as intellectual freedom and critical, open enquiry. outlining the advantages and risks of having such a large cohort of international students from the PRC in Australia. The Australian government should not remain silent about attempts to stifle academic freedom nor should it be shy about expressing appreciation for the contributions of international students. Universities, with the Go8 in the lead, should initiate discussions with education officials at PRC consulates to mitigate tensions as they arise on campus. The government should provide financial incentives to universities to lessen the isolation of international students (for example, to build student housing in which Australian and international students would be encouraged to live in closer proximity). The Department of Education, peak bodies such as Universities Australia, and individual universities should invest more intensively in studies assessing the aspirations of PRC students (and their parents) in choosing Australia, and the results of the student experience. The federal and state governments should jointly declare a ‘National International Student Weekend’ to encourage Australian families to welcome international students in their homes. Universities, with the support of the Australian government, need to implement high-profile programs which deepen interaction of PRC students with Australian society, for example a prestigious internship program in Parliament House and the High Court of Australia. Universities, with the close support of their alumni of Chinese descent should prioritise investment in strong university alumni associations in China (akin to the Harvard Club model) to sustain positive, long-term connections with PRC graduates. Dr Bates Gill, China Matters Board Director, is a professor affiliated with both the Department of Security Studies at Macquarie University and the Strategic and Defence Studies Centre at the Australian National University. Ms Linda Jakobson is the CEO and Founding Director of China Matters. 1. Australian Government Department of Education and Training, ‘End of year summary of international student enrolment data – Australia – 2016’, 20 December 2016. 2. Minister of Trade, Tourism and Investment, ‘New record for international education exports’, 2 February 2017. 3. Lisa Visentin, ‘Corruption rife in international student sector of leading Australian universities, ABC’s Four Corners reports’, Sydney Morning Herald, 20 April 2015. 4.NSW Independent Commission Against Corruption, Learning the Hard Way: Managing Corruption Risks Associated with International Students at Universities in NSW, April 2015. 5. Australian Government Department of Education and Training, ‘International Student Survey 2014’, (unpublished data). In this first policy brief, Dr Bates Gill and Ms Linda Jakobson address the question, ‘Is there a problem with Chinese international students?’, and suggest several measures that could be taken to mitigate risks related to the country’s largest international student cohort. This policy brief is published in the interests of advancing a mature discussion of the PRC’s debt problem and its implications for Australia. Our goal is to influence government and relevant business, educational and non- governmental sectors on this and other critical policy issues.